'Tis the season for the dun letters. We get them all year. "Please give us money" but they can get particularly abundant between October and December 15th. I keep thinking, "Lord, if you'd let me win the lottery, I could give this charity some cash." Somehow, that logic doesn't seem to have swayed the lottery god one bit. What do you mean I have to play to win? (sigh) There's always a catch. Anyway, I got this in the mail recently. 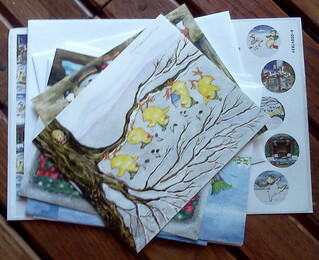 These are Christmas cards, return address labels and stickers, one for each card. I'm pretty inured to the pleadings of the enclosed letters. I just don't have cash to send to anyone. I make a donation to a couple of charities once a year, not at Christmas, and that's it, so your letters of misery and want don't move me. Well, I shouldn't say they don't move me, but when you have zero to give, that's what you're handing out. I like getting these cards and address labels. I would hope it costs the charity in question a few pennies to have bulk cards printed. Labels, heck, I could, if I wanted to take the time, print my own address labels on a home printer. Merge a mailing list and you've just got the cost of someone's time to feed labels into the printer, box up the stuff and ship it. Hence, I don't feel guilt at all in taking the cards and labels and using them. Every year, about this time, I go through the address book and count the number of cards I need. My count this year is 60. Now, I tend to buy cards that I like and I always seem to have cards left over. Two years ago, I was going to make my own cards. I still have that intention but I don't remember I was going to do that until right about now and that's no good for actually getting the cards made and mailed. So, once again, I'll need to buy a couple of boxes. Getting 5 cards from this charity, 6 from that one, 4 from another, help cut down on the total number of cards I actually need. I tend to gravitate towards cats or humor and love humorous cats Christmas cards, although they haven't been in abundance in recent years. The stickers with this batch went into my sticker pile and the address labels went in with my address labels. I'm getting low on the labels I like so I'm probably going to have to send in an order at the end of the month, but the sheet I got with these cards will help stretch what I have. I know a number of people chuck the whole packet in the garbage. Not me. I may not send you any money, but I certainly appreciate you sending me something I can use.